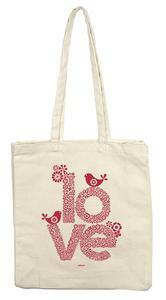 Love Tote Bag, ISBN: 4260416450158 - available from Nationwide Book Distributors Ltd NZ. Carry your precious books with love and style in these high-quality tote bags. Holds up to 25kg. 100% cotton.